Day 587 - I keep forgetting to remember! Happy Sunday! At least I REMEMBER that it's Sunday! Even the BLOGGER software can't remember my login when I click 'remember me'. Sheesh. Thanks, Blogger. What is UP with our brains (or is it down)? Are we too busy to remember anything? This morning I asked Charlie to fill the bird feeders, which haven't been filled in quite a while. He agreed 'Yes, I thought to myself that today would be a good day to fill the feeders. I thought I was going to do it....well, I can't remember when I was going to do it'. By the way, that means he couldn't remember the last time he FORGOT to do it. HA! We had a good laugh about that one. We just finished a yummy breakfast of ham and cheese omelettes topped with homemade salsa, home fries (with the skins on), and toast with honey and apple butter. Confession - I made home fries this morning because I had left the extra baked potatoes (wrapped in foil) in the oven all night when we had roast chicken and baked potatoes for supper. Neither of us could REMEMBER to take the potatoes out of the oven and put them in the fridge! Maybe I'll remember the way to the health club today to go swim. I have to do that for sure because I just ate a huge breakfast. Not sure what else is happening today. Have a nice Sunday and TTFN! It's the last Saturday in September. Another month closer to MY retirement, which won't be for YEARS. Charlie's first day of being retired, and he had to get up at 4:30am! Poor thing. His daughter and son-in-law are moving today, and Charlie is helping. Their 'move agenda' starts at 6am. Ugh! But that got me up early too, so I can say HELLO on 'da blog' and have breakfast before I go to water aerobics. Hang on - take five while I get some coffee (meaning, make myself a Foame' Latte'). I'm back, after slugging down about 1/3 of it in one gulp. Let's see - the annual TACA fall arts and crafts fair is this weekend - I usually go but I think I will this year. I am afraid I'll see something that I can't resist that is very expensive! If there was something in particular to shop for, I would definitely go. It's often very hot when the fair is going on, but today is going to be PERFECT - low 80's and sunny. NICE! There is a new craft fair 'Christmas Made in the South' next weekend at the AgExpo center about 10 miles from here. A Christmas one - in October! I will definitely check that one out. It has an admission fee, but I would spend that in gas to get to Nashville. Have a nice day, everyone! Happy Saturday! Day 585 - It's 'Charlie' Friday! Greetings, TGIF-ers! It's Friday, and it's Charlie's last regular day of work. Also chant 'Char-lie! Char-lie! Char-lie!' in honor of his pending retirement. Charlie said his retirement luncheon was just wonderful. It was potluck - chips n dip, BBQ, fried chicken, sloppy joes, potato salad, baked beans, cakes and desserts, etc. The folks at work had a 'retirement medal' with flashing lights for him to wear (he put it on last night at home too). They made an 8x10 scrap book and autograph album for him that they signed and wrote messages to him wishing him a happy retirement, good luck hunting and fishing, etc. They also signed around the border of an 8x10 photo of charlie with a big straw hat on from some other party they've had over the years - it is PRICELESS. He ALSO got some gifts including a gift card to Bass Pro Shops and a fleece jacket. Charlie's sister sent a couple of stories to a co-worker to tell at his 'roast'. My favorite is when Charlie was little, and Charlie's mother called out the door for him to come home. Once, twice she called, then the third time she used his whole given name, and that brought him in. He said 'Mom, I didn't hear you the first two times you called'. HA HA HA HA HA!!! He really enjoyed his send off, and was touched by all the attention he got. Have a nice FRIDAY, Charlie! We started discussing retirement around 4:30 this morning, by the way. Charlie says he thinks about it all the time, and I do too, quite a bit anyway. We are supposed to get some much-needed rain this morning. Can't wait for that! Maybe I'll get to use the windshield wipers on my new car? Maybe even the front ones AND the back? Too much excitement! Hey, don't forget - it's SURVIVOR night! We already can't stand the whining girl from New York who thinks she's above it all, and the lady wrestler with her lip rings is less-than-stellar. Say farewell to September this weekend, by the way. 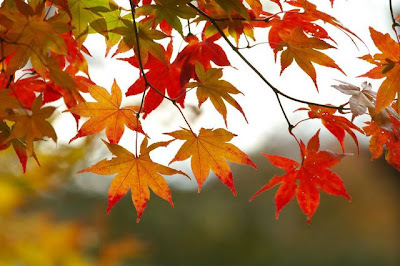 Falling temps and falling leaves ahead! Greetings, Bloggy Midlife and Midweekers! Charlie's last day is t-minus TWO and counting! Lucky Lucky Dog Dog. He has had a 'shadow' for the last couple of days while training someone. Charlies 'customers' - who were satisfied with just phoning when they had an issue - are now trying to DOCUMENT how he has fixed their computer in the past, so they can do it themselves from now on. Rather humorous. Others are calling, asking if there is a job opening for his job. Also humorous. Speaking of jobs - one guy who has only been here a few months is leaving our company because he was unable to sell his house in Iowa and move down here! I guess that proves the housing market has slowed to a crawl. He was waiting for the sale before moving his family here, and that hasn't happened, so he is returning to Iowa. That is a shame! I swam yesterday - started off in the indoor pool because we had a popup rain shower at the health club (none at home), then moved outdoors when the rain stopped. I am about the only one brave enough to get in the outdoor pool these days, but the temp really isn't bad, and I greatly prefer to be outdoors in the air and sunshine. The pool aquatics director said all the folks from New England say the water isn't too cold. (That's because we know what cold water is!) He said the last guy that scoffed at the outdoor pool temp said he was from Cape Cod. Well - better get at it - have a nice Wednesday and TTFN! I ‘assisted’ with a baby shower yesterday at work. SOMEHOW I ended up being responsible for the cake, and the decorations, and the paper goods. How did that happen? I picked out a Noah’s Ark cake at Sams Club. Trust me, the finished product did NOT look very much like the gorgeous photo. The animals for example, were just animal picks… Lesson learned. Anyway – I went to Sams yesterday at lunchtime to pick up the cake. I picked it up, paid for it, and got to the car with it before noticing it said ‘CongratulaTONS’ rather than ‘Congratulations’. Next time, I will not be responsible for the cake if I can’t be sure they won’t mess up the word ‘Congratulations’. This was the biggest baby shower I have ever been to. I think there were 50 people there, and tons of gifts. We started late, by the way. The person responsible for making the punch arrived after the shower had begun, and didn’t bring enough supplies. He had to buy more soda from the soda machine in the break room. Another person arrived late and started assembling her appetizers after the guests had started eating. When did life change? Doesn’t a start time of 2:30 mean anything to anyone anymore? My favorite part of the shower was taking the leftover cake downstairs to the coffee station in our department. I crooned my best Siren song; ‘Free Cake – better hurry! Free Cake coming through!’ I had 4 hungry programmers behind me immediately, salivating over Free Cake. I heard the pitter patter of polished loafers from every direction, making a beeline for free cake. My manager brought her son in, who just turned 4. They came by my desk after the shower. I gave him some little Halloween pretzels I had brought in. The pretzels are shaped like pumpkins and bats wings. He kept bending over and dropping his pretzels, until he had spilled them all. I gave him 2 fresh packages (unopened) to eat in the car, and sent them on their merry way. Day 581 - Monday again! T-minus 4 days and counting till Charlie goes on leave prior to his retirement. Today is his last 'commuting' Monday. He remarked this morning after making his breakfast oatmeal; 'I'm kind of out of my routine this morning. But there's no use in getting back into a routine at this point...' NO FAIR! I am helping with a baby shower at work this afternoon. I need to go to Sams Club at lunch and pick up the cake. I've never placed a cake order with them before, so I hope they didn't lose it, and I hope it looks nice! It's a Noahs Ark theme with little animals everywhere, and little animals on the plates and napkins, etc. OOps - just noticed the time. Have a nice Monday, everyone, and TTFN! Day 580 - Happy Fall, Y'all! It's the first day of Fall, and it's supposed to get up to 92 degrees here. Yesterday was hot too. I do love fall - but I don't like the 'get up at dark and leave work at dark' part. This is going to be rather short so Charlie and I can go to the health club and swim. Yesterday mornings water aerobics class had an 'all-female' attendance, so we talked about 'girl stuff' - including kids, food, hysterectomies, and medical problems. It is pretty funny how different our conversation is when there aren't any men participating. Speaking of MEN, I *think* I saw an acquaintance (don't know him well) at the health club parking lot yesterday. If I am wrong, it's a funny story anyway. He didn't have his flashy car yesterday, he was driving an older pickup truck instead. He didn't speak to me when he was driving the pickup. I guess he can only TALK if he feels 'centered' in his flashy car! HA! Have a nice Sunday, everyone, and TTFN! Day 579 - Saturday, lovely Saturday! For no apparent reason other than lovely weather - work let out at 3 yesterday. HEAVEN! Speaking of Warriors, today is opening day of bow-hunting season. Mr. Charlie left the house this morning at 3:40am - ugh. That is NOT fun in MY book. I got up before 5 though, so UGH on ME. For some reason, I had a compulsion to clean the bathtub. Yes, I must be ill. Product Endorsement: The best cleaner I have found for our tub unit is called 'Zep', available at Home Depot. You just spray it on and leave it alone for 15 minutes or so, then wipe all the soap scum and dirt away with a sponge and the tub water running. It is really good stuff. I am also going to clean the microwave today. AND I have a wash in. Now if some phantom window washer would just come and do my windows, I'd be blissfully happy. I hate washing windows and mine are awful. Oh well. I'll be going to water aerobics as usual this morning, then shopping (also as usual). Day 578 - We love you, Friday! Greetings, Bloggy Ready-for-the-weekenders! It's Friday! You know what to do - march in a circle, carefully. Wouldn't want you to get dizzy or anything and bring a lawsuit against the blog for the suggestion. KIDDING! ONE more Friday for Mr. Charlie, the lucky DOG. (roll sound clip from 'Atomic Dog' - bow wow wow yippee yo, yippee yay). One of his buddies is taking him out for lunch today. Speaking of lunch - earlier this week, Charlie and another co-worker tried a cajun place in Nashville named 'Bro's' - he had so much food there he couldn't eat dinner. That is amazing. Charlie's root canal went fine - his mouth is still a little tender but he says it wasn't bad at all. He went home afterward and made a pot of chili that we enjoyed while we watched the Survivor premiere. Temp today is supposed to be around 90 with sunny skies. I swam in the outdoor pool at the health club yesterday - it was chilly - 81, but I'd better swim outside while I can. Hey! It's almost FALL, y'all! I can't believe it. Where did the summer go?? Guess I'd better get at it, folks! Have a great Friday and TTFN! Day 577 - Party, or Root Canal? Greetings, Bloggy Short-Timers! Friday is just a day away! He got the dates mixed up for his retirement luncheon and his root canal. Today is the root canal, next Thursday is the retirement luncheon. Oops, Charlie. It's the SURVIVOR Premiere tonight - what will this season be like?? I am going to swim early and not wait for the 6pm water aerobics class. It just doesn't seem polite to miss the first episode. Did anyone watch the premiere of 'Kid Nation' last night? 40 kids are running an abandoned western ghost town for 40 days. They have divided into 4 teams, have leaders, and jobs. They make a small amount of money at their jobs which they can spend at the saloon for root beer and candy. They had a challenge that resulted in choosing a reward - the leaders wisely chose outhouses over a television set. One cute little 8 year old decided he was too homesick and quit. Everyone else has made it through so far. Have a nice Thursday, everyone! Day 576 - Midweek - Hooray! Greetings, Bloggy Middle of the Road and Middle of the Week-ers! This month has FLOWN by! I have so much to do by the end of the month, but I can't get stressed out about it. I like to BUY THINGS - even grocery items. I always have! I got a reply already from Cracker Barrel - they said the store is using the new 'optimized menu'. I quote: This was changed to provide faster service time with fewer mistakes made by our employees. I think that's hilarious... We'll give you less, but we'll give it to you faster and we won't screw it up as much either. Day 575 - Twofer Tuesday! Made it through another Monday. CHARLIE only has ONE Monday to go, the lucky DOG. For some reason, I keep thinking it is Wednesday today. Wishful thinking, I believe. Charlie has a farewell luncheon this Thursday at work. So far, so good with my new car, everything working perfectly and decent gas mileage. Now that I have 4-wheel drive, I am already imagining driving in A LITTLE snow with no ill effects. Hey - we went back to Cracker Barrel last night and they have changed the menu significantly. GONE is the whole page of low-carb entrees. GONE is the grilled steak salad I used to get! GONE (at least at dinnertime) is the separate menu of breakfast items, replaced by just one page on the back of the lunch/dinner menu that lists 'breakfast all day' items. Let's see - let's increase our business by offering LESS to our customers. What the heck??? I think I'll go to their website and complain. TTFN! Greetings, Bloggy Commuters! It's Moan-day again! We had a lovely day yesterday - swam at the health club, took our sightseeing trip, and Buddy Joe came over to join us for the Titans vs. Colts football game. (BTW - when the Colts win, which they did, everyone is less upset because PEYTON is the quarterback and he was a Tennessee college QB). The Red Sox lost too, thanks to a multi-run home run by my pretty-boy Derek Jeter. I think it's time to make an announcement. Are you sitting down? Charlie has turned in his RETIREMENT paperwork at work. YES, retirement. Doing whatever you want to each and every day, with a check coming in each month for the privilege. Charlie's farewell lunch at work is this Thursday, and his last working day is a week or so later. WE'RE ALL HAPPY FOR YOU AND JEALOUS OF YOU, CHARLIE!!! TTFN and get busy planning for your retirement! Day 573 - Sunday will be fun-day! I don't understand the church sign they have out at the moment. It says 'Man plans, God laughs'. I am not sure what that means. this translates as "Men plan and god laughs." It was COLD last night - 47.5 on the thermometer this morning, the coldest it has been in a LONG time. High temp expected to be a chilly 78. Later in the week it'll warm up again to the high 80's during the day. We have a fun day planned - we're both going to the health club this morning to swim. Then we are taking a little drive to figure out a new interchange on the highway near where I work. I don't know if it will be beneficial to me or not. Then we are watching the Titans football game at noon - not sure if we are watching it at home or elsewhere. Then we'll see how much time is left in the day and decide what else we can do. Greetings, Bloggy Weekenders! I'm baaaaack - kind of! Our internet is only working on one computer - the wireless is still down so I can't do anything while I am in the den where the TV is. I am realizing how much time I spend at the *&^% computer and I don't think I like it. I want to go read. On friday, the ONE day I couldn't check the overnight jobs at work, of course there was a problem. Not a bad one, but took up some of the morning. I am trying to catch up at work, only to fall behind again! I *might* get there eventually. I had to throw a black swimsuit away Thursday night. I brought it home for Charlie to see first, and he can confirm my story. Usually when a swimsuit decides to 'cave', it just starts having threadbare places or stretch marks. Sometimes little 'white spots' appear where the elasticized material has shredded. MY SWIMSUIT had a white spot (frayed) in ONE place. MY BELLY BUTTON. That is where it decided to give up the ghost. What the *&^%$ is THAT? Maybe the pool noodle or the weights have contributed to the 'early fraying'? Maybe my belly button has grown enough to try to take over the earth? What the heck?? I showed everyone in the water aerobics class, by the way. Noone had ever seen a swimsuit bend under such pressure before. Should I be proud? I think NOT. Day 570 - Thursday already! Greetings, Bloggy Workers! The end of the work week is near! I just logged onto work and my mailbox is over the size limit. Cleanup needed today. We got rain the day before yesterday - it's a beautiful thing! It's also cooled down - will be in the 80's this week like it's supposed to be. Water aerobics tonight, but not until 6pm. That is pretty late for my schedule, but I do enjoy it. I am sick and tired of buying RED grapefruit for a dollar or so apiece, and then cutting them open to find they are PINK instead. What gives?? I want RED grapefruit, not PINK! It is already 6:08 so I am going to have to wrap this up. I dreamed last night about a wedding (I can't remember whose) that was going to get rained on. Everyone was scrambling to find umbrellas, and I thought the staff at the hall should be all lined up like butlers with umbrellas to help everyone inside. Gotta go or I'd write more about my dream. TTFN! Day 569 - Guilty as charged - in my dreams! Greetings, Bloggy Dreamers! Viva Las Vegas! I dreamed last night that I was in Las Vegas. (Charlie told me this morning that I was asleep while he was watching Jay Leno do 'Jaywalking' from Las Vegas, so subliminally I must have picked up on that). I was outside a casino - and a guy casually offered me a puff of his cigarette (NO, not the funny kind). I thought that was the nicest gesture. I took a huge puff of it and it pretty much burned through my lungs, but I still enjoyed it, and when the guy walked away I wished I'd asked him to give me one. I remembered then in my dream that I used to smoke. So what does that mean in the dream world? Once a smoker, always a smoker? I do occasionally dream about smoking, though it has been MANY years since I smoked! It is always a fond memory though. So anyway - guilty as charged. I smoked, and I liked it. I haven't managed to leave the office until after 5 so far this week, though I've been going in at 7am. Maybe tonight. I bought PF Changs moo shu pork last night and wonton soup to go, because I had a craving for Chinese food. It was good, but not as good as the China Palace in Rhode Island where we used to go. The wonton soup was VERY good, it's my favorite item there. 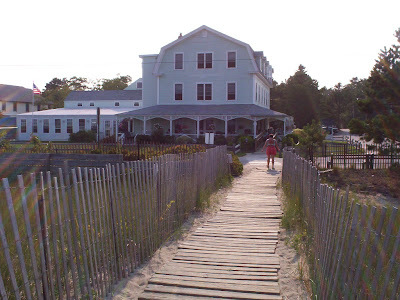 Today's photo is of the Quillen, a beautiful building where we stay at the Beach. The boardwalk takes you across the sand to the ocean, which is freezing cold but still gorgeous. Sometimes I get one of the rooms on the eastern end (you can see the windows on the second and third floors) where you can look out at the ocean and see the sunrise. LOVELY. Charlie went swimming with me on Sunday, but we took separate cars so I could go to Sams Club afterward and Charlie could go home to watch football. I returned home to find he was drying his bathing suit by hanging it over the tailgate of his truck... Now YOU tell me if that is a 'man thing'? Charlie had a 'triple combo' platter with mini-burgers, southwestern chicken egg rolls, and steak rollups. I had an 'orange chicken' bowl with rice and vegetables. Very yummy. It's already 6am so I'm going to make this short. Have a nice Tuesday and TTFN! Day 567 - Maybe, Kinda, Sorta - I think! 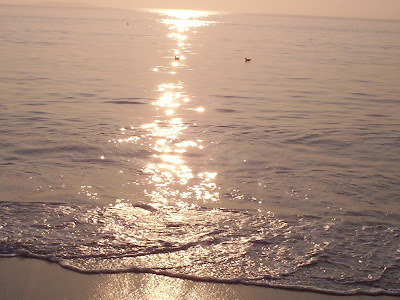 Here is another lovely photo of the ocean in Saco, Maine. You can just see a couple of seagulls floating on the still water. Awesome! Yes, I have to go back to work today after being happily on vacation since August 23rd, 2007. Yes, the lunches are made. Yes, Blogger is as slow as I feel this morning and I even shut it down and logged back in again to see if it will go faster. Sheesh. Yes, we're going out for dinner tonight, but to Applebees rather than Cracker Barrel due to road construction issues. Gotta go to WORK, have a nice day! TTFN! Sorry, I haven't figured out what the day count is yet. Yesterday we were busy attending a surprise birthday party for Charlie's sister, which was fun. She lives about 90 miles away. 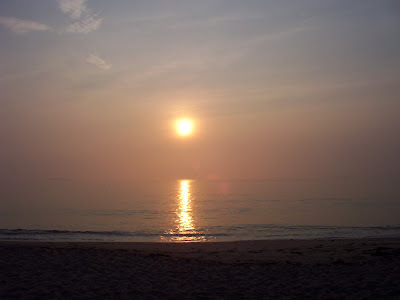 Here is a beautiful sunrise on the ocean in Maine, right before we had Tai Chi class on the beach. Church sign of the week - Have YOU been a blessing today? That's all - wish I could have consumed another lobster but I didn't have room. Everyone was impressed with how much Evan ate - he probably bested his mother. Greetings, Bloggy Travelers!! We're baaaaack, safe and sound! Yes, I'll fix the number of days when I have time to calculate what day we're actually on. I have that 'Woe is me, my vacation is almost over' feeling - I need to have more vacation! Maybe several months a year might be nice to start. The house is still in one piece, nothing is leaking, the freezer is still working, so all is well. Thank goodness! Do you ever worry when you're away that you'll come home to a crisis? The drought and heat is still here - whole fields are just brown and dry like the desert, including fields of corn. Poor little cowies and goatages! We had a perfect trip - saw lots of friends and family, and I am already ready for Thanksgiving in Maine! I guess I'd better book a rental car for that though first. Our vacation is almost over... boo hoo! Our dinner for 10 last night was so fun! We had great food, plenty of chatter, and the waitress was friendly and efficient and let us split our checks whatever way we wanted to. Mom 'n Gil are on their way back to Maine, and we are at the library again, waiting for 9:40 when we can check into our flight for tomorrow and print boarding passes (15 cents each to print at the library). Eeew - I almost typed 'libary', I'd never hear the end of that one! We are 'attempting' to print our boarding passes - the first time I got a script error, and I tried again and it says it sent it to the printer. I hear Charlie feeding change into the print station change thingy. (technical term). Charlie has returned with our boarding passes - mission accomplished!!! Hooray! Evan is waiting for us back at the condo - we've had a wonderful breakfast of bacon and eggs, sliced tomatoes, and Panara sourdough bread. (extra YUM-O for the bread). We've eaten a whole jar of cranberry/orange marmalade from Cape Cod this week too, and a jar of salsa. Guess I'd better check email now - have a wonderful thursday, a great Friday, and I'll blog at ya on Saturday! Day 560-something! I can't count the days on vacation! What day is it? Wednesday? Really? I am starting to get the 'vacation is almost over' blues. I am at the Newport public library, and we have one hour internet access. I will make this short, but want to let you know that all is well. Vacation is wonderful, the weather is PERFECT, my son has had a mini-vacation and brought a friend out with him for a couple of days, and my hair is still wet from the pool. We have done a lot of walking and a lot of eating this week, and had lots of time with family and friends. We'll have a party of TEN for dinner tonight. Holy smokes! Our trip to the Nordic lodge was wonderful as usual - I ate 3 lobsters and 4 king crab legs and a ton of other stuff. I wrote it all down but I don't have time right now to type it all in. Have a nice rest of the week, everyone! I'll be coming back Friday afternoon.